(Newser) – Nintendo's new Wii U console will hit stores in the US on Nov. 18 for as low as $299, the company announced today. For that price, you'll get just the console, its unique gamepad controller, a charger, and an HDMI cable, Mashable reports. Upgrade to the $349 "deluxe" bundle, and you'll get an extra gamepad, charger, and the game Nintendo Land, one of two launch titles. How do you play tennis with a gamepad, and get any exercise? As it happens, my body is ready. Bring it on. X-box, PS-3, wii....it all depends upon the genre one is. My son is 10, I don't let him play Teen games or anything rated higher. X-box & PS-3 are very limited on selections for him. but the wii was/is perfect. 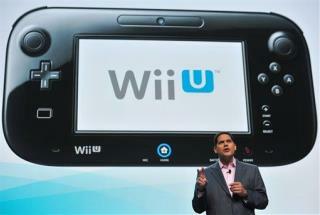 I will be getting hinm a wii U for Christmas. His next console in a few years will probably be an x-box 720 or PS-4. But for now he is in wii mode. he has several friends that have x-boxes & PS-3's that play war craft, call of duty, etc. personally i wouldn't dream of letting a 10 year old be subjected to those types of games.